The last three of posts and this post relate to how Canada and Québec consistently exchange issues which mutually influence their collective psyches and give rise to a symbiotic relationship. This post will provide the last of three such examples. This one is a bit different from the last post. I’ll write about a “sensitive” and “controversial” issue being discussed more and more in English Canada, but which has not yet fully made it into the arena of public debate (both politically or across the country). However, there are increasing signs which point to it soon becoming a full-blown public matter of debate. If it does continue to build more steam in English Canada, it very much has the potential to make the leap into Québec’s arena of public debate. The matter relates to foreign investment in Canadian real-estate, and how it may be affecting (and misaligning) the affordability of housing for “average” Canadians. It is a debate which primarily involves Toronto and Vancouver, but which is not exclusive to these two cities. Anecdotally speaking, from my own observations, there appears to be a growing belief among residents of Vancouver and Toronto that massive foreign investment may be flowing into the real-estate markets of these two markets, primarily from China, but also from other countries. I consistently hear people say they believe this to be a major factor as to why the average home price in Toronto is now over $1,000,000, and over $1,500,000 in Vancouver (now rated as the second most expensive real-estate market in the world after Hong Kong). The argument goes that foreign investors (who do not have immigration status in Canada) “park” their money in Canadian real-estate for investment purposes, and then rent the properties out at very high rents – all the while shutting out hundreds of thousands of local residents from their own real-estate market. Up front, I want to make myself perfectly clear that I do not know if such allegations are accurate or not. I have yet to see any major studies on the issue. I also want to be very categorical in stating that even if this were to be a factor in rising real-estate prices, it would likely be only one of several reasons. I have searched high and low, but I cannot find any in-depth studies regarding this matter. However there are numerous “incidental” studies out there which perhaps lend credence to the above public beliefs. For example, there are studies which show that power consumption rates during peak hours indicate that up to 40% of many “high sales” neighbourhoods demonstrate properties to be vacant, or that driver’s license holders tied to many single-family home neighbourhoods have low Canadian permanent residence or citizenship rates. This clearly indicates the need for urgent and comprehensive studies to be conducted to determine if such anecdotal or observation-based evidence is indeed correct or not. Australia conducted studies and found their cities did have a serious enough problem with foreign investment (primarily from mainland China) in their housing markets to warrant Australia imposing residency requirements in order to purchase Australian real-estate in order to correct disproportionately priced real-estate markets. There may be reasons in Canada why we are not seeing such studies conducted. City governments may fear the results may indeed show a problem exists. They may then fear losing property tax revenue if housing restrictions are imposed. In this sense, this debate may become highly political. Here are some reasons, from my own anecdotal observations, as to why I believe there should be objective and independent studies into this issue. As you may be aware, I lived in mainland China for over a decade. The Chinese currency is not a freely traded currency on world markets. Mainland China’s population does not have access to the diversity of investment opportunities as us in Canada. They don’t have a free and developed mutual, bonds, RRSP, REP, securities or derivatives market. Where such opportunities do exist, they come with excessive risk, little return, or they may be highly restricted. Therefore, for most of China’s 1.3 billion people, the only options for investment are (1) housing, (2) domestic stocks, and (3) gold. Yet housing purchases in China are restricted to one property per person, Chinese stocks have not performed for years, and gold yields little return. For many (perhaps most) mainland Chinese, the only “safe” and “secure” investment is overseas real-estate. Canada, the US, and Australia are the preferred markets. When I resided in China, I met many Chinese (often middle-class Chinese, earning a middle-class income between CAD $50,000 – $80,000) who owned property in Canada or who had friends/relatives who owned property in Canada. Yet they did not reside in Canada. Statistically, China has five to six times Canada’s population which has just as large a personal net worth as five to six times Canada’s population. If only one tenth (the equivalent of half of Canada’s population) were to “park” their money in Canada’s “safe-haven” real-estate, the repercussions to Canada could be enormous. If the Canadian market were to turn sour, and the money was pulled back to China in a knee-jerk reaction, the repercussions to Canada’s real-estate market (and thus its economy) could be devastating. This is yet another urgent reason for serious, independent studies. Another anecdotal story pertains to farmland. A few weeks ago I was in Saskatchewan. While waiting for my luggage at Regina’s airport, I noticed the following sign above the luggage carrousel. 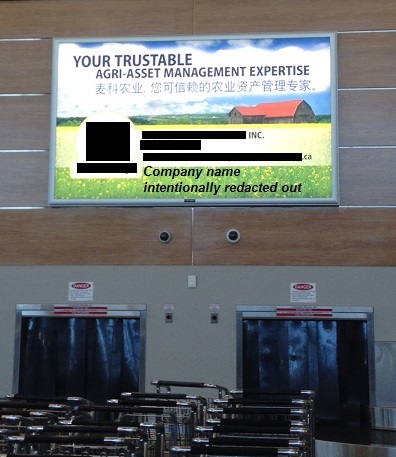 The company is a company which facilitates Saskatchewan farm purchases (it is written in simplified Chinese, and thus quite possibly targets Chinese with a mainland education). Such a company must operate within Canadian laws, so in no way am I insinuating it is doing anything illegal. Incidentally, while waiting for my luggage, there was a group of approximately 15 Chinese nationals also waiting for their luggage. I speak fluent Chinese. Out of curiosity, I asked one of the gentleman what brought them from China to Saskatchewan. When mainland Chinese find out I speak Mandarin, they generally open up much more to me than what they would to other people. He responded that they all came from China to purchase farmland. I told him I was a bit “confused” because I was under the belief that Saskatchewan had a Canadian citizenship requirement for those who purchase farmland. The man told me that there are always ways around this. A second man in the same delegation overheard our conversation and he said he sent his daughter to the University of Regina, instead of a US university, specifically to be able to get around these rules (perhaps she forged Canadian connections through which to fraudulently funnel such investments?). My uncle and cousin own large tracts of farmland in Southern Saskatchewan. I mentioned to my family what I was told at Regina’s airport, and I also mentioned the sign I saw at the airport. I was told that within the previous four months, my uncle had three mainland Chinese delegations knock on his door, unsolicited, asking to purchase his farmland. Throughout the same week I spent in Southern Saskatchewan, I also heard numerous times that many people are becoming quite frustrated with the situation because foreign farmland investment has pushed Prairie farmland to unaffordable limits for most local residents. Because land is so expensive, and because it would take new farmers so long to pay off their land purchase, banks will no longer grant loans to start-up farmers for fear that it would take too long for famers to see profitable return on their land purchases. Several times I was told by different individuals in Saskatchewan that the best new farmers could hope for would be to become tenants on Chinese-owned farmland in the Prairies. I do not know if these anecdotal stories are founded or not. Regardless, I can find no studies to either prove or debunk the possibility. That in itself is of great concern. On 27 March, 2014, CBC news reported that a Vancouver bungalow sold for $567,000 above the asking price of $1.6 million, for a final sale price of $2.2 million. You can read the CBC article BY CLICKING HERE. This quickly resulted in 830 comments (which is an unusually high comment count for any CBC article). Most comments appear to be from Vancouver residents, and the vast majority are scathing remarks towards Chinese investment. I have rarely ever seen such public anger expressed in the comments section of any CBC article. There appears to be serious public resentment lying just below the surface. It leaves me wondering if there will soon be a breaking point (and thus a turning point) with respect to how people channel their frustration, and the direction this debate will take in Canada. I will say this: It will NOT be good if public frustration begins to be vented on our local Chinese Canadians (local Chinese Canadians are not the “foreign” investors who park cash in Canada without residing in Canada). This is yet another reason why very urgent studies are required to paint an accurate portrait of the situation. Because I do speak Chinese, I have had numerous discussions with local Chinese Canadians in Toronto. The people I have spoken with are also becoming very frustrated with what they also perceive to be unsustainable levels of mostly “foreign” Chinese investment in the Canadian real-estate market. Chinese Canadians I have spoken with also believe such investment is tipping Canadian housing to unaffordable levels. Of equal concern, they are concerned that Canada’s general public will confuse Chinese Canadians and Chinese “foreign” investors. Some feel that the general public is already beginning to take frustrations out on Chinese Canadians (who are not the cause of this issue). This is very serious, and it should be of great concern to all politicians. We must avoid a “witch-hunt” and “run-away” anecdotal public conclusions at all costs. Yet, you may say I am talking from both sides of the mouth. You may say to yourself that I am contributing to such anecdotal conclusions by what I have just written. Understand that my point in writing this post is not to say this is “definately what is happening”. Rather it is in part to demonstrate that if I, as a member of te public, believe there may be possible problematic issues, even in the absence of proof, then many others also may be thinking in then same vein. The difference is that I am more than willing to accept that my own percsptions may indeed be wrong in the absence of objective studies. The problem lies in the fact that other people may not accept the possibility that their own conclusions may be wrong. Their own frustrations may turn into a public witch-hunt, and innocent Chinese Canadians or permanent residents may bear thee brunt of frustrated public sentiment. That’s the danger, and that’s why we need stufies to figure out precisely what is (or what is not) happening in our real-estate maket (be it government sponsored or government endorsed independent studies). This debate has not yet become a major political debate in English Canada, but I believe it is moving in that direction. However, Québec’s population does not yet seem to be aware of this debate in English Canada. With this being said, I still believe this “English Canada debate” does have the potential to jump from English Canada to Québec. In January, I was in Montréal accompanying a friend as she was condo shopping. We looked at five separate condo complexes. In two of the complexes there were delegations of mainland Chinese investors looking at condos at the same time as us. They all averaged 3 to 4 couples (6 to 8 individuals). Again, I spoke to them in Chinese. I asked what happen to “bring them to Canada”. All lived in China, and all made the trip to Montréal on a condo-investing mission. They told me Canadian real-estate investments are more lucrative and safer than Chinese domestic investments – particularly for retirement capital. After my friend and I finished looking at condos, I asked the condo sales representatives if “mainland Chinese sales” constitute a common type of sale for them. They responded about 40% of their sales inquiries are from Chinese buyers, and about half of those are for to purchase a condo for their children temporarily study in Montréal (with the intention to renting out the condo after their children graduate). Yet, the remaining half are simply for an investment property which may, or may not be rented out. (Note: they did not tell me what percent of their “sales” were to foreign Chinese nationals, but their responses regarding “inquiries” are quite telling). This appears to demonstrate that real-estate investment concerns which exist in English Canada may also exist in Québec. The major difference is that Québec’s population has not yet began to debate the issue, whereas we’re starting to see potential signs of a very heated (and intolerant) debate in English Canada. If the debate in English Canada becomes emotionally adversarial, I would not be surprised if it triggers a similar debate in Québec. In the meantime, I just hope that people don’t confuse the issues and incorrectly take their frustrations out on Chinese Canadians who are struggling with high home prices just as much as other Canadians. I strongly urge our politicians in Toronto, Vancouver, and Montréal to conduct impartial, in depth studies into this matter as quickly as possible, so as to either prove or disprove what many Canadians perceive to be a major problem. This concludes the four-part mini-blog series on how public policy and public debate can cross back and forth between English Canada and Québec. I hope I provided some concrete examples which show how both side’s issues can mutually affect how all sides view the world, how they evolve and how they develop together… to the extent that both sides often think more along the same lines than not. The last couple of posts, and this and the next post relate to how Canada and Québec’s issues, politics, societal concerns, and social spheres mutually effect each other. This is why we very much share a collective psyche in so many spheres (more which is shared than not). It is a symbiotic relationship. The following is the second example of three where Québec and Canada are mutually, and currently (right now) influencing and shaping each other’s societal views and collective psyche (an “averaging out” and “melding” of the two, if you will). The latest public debate regarding reasonable accommodations pertains to the wearing of Niqabs in public, or during the participation in / exercise of official government bureaucracy. The debate started in Québec before it took off in the rest of Canada. The debate took flight in Québec in 2012 with issues surrounding the Chartes des valeurs..
Now that we’re in “unofficial” election mode for the 2015 Federal election, the debate has recently made the leap from Québec into the overall Canadian arena in the last few months (since the end of 2014). However, I do not believe the debate would have become mediatized or political elsewhere in Canada had the matters not already been issues in Québec. Federal pan-Canadian politicians, desirous of votes in Québec and elsewhere in Canada, have brought the debate into the full public Canadian arena (which perhaps would not have happened had certain high-profile federal politicians not got their fingers in it). A mix of Middle-Eastern politics, current events and religious fundamentalism (which in my view should never have been mixed into the Niqab debate) has been capitalized upon by opportunistic politicians – and these completely unrelated matters have now somehow ended up being tied to a discussion regarding the wearing of the Niqab by the narrowest of minorities in Canada (perhaps involving only a few hundred individuals across the entire country). Three posts ago, you saw how this debate is now entering the realm of federal political attack advertisements – in a very high-profile manner to say the least (click HERE to see one such ad against the Niqab, but be aware that there are others out there as well). Generally speaking, for many Canadians, this is the first time they have come face-to-face with this specific debate. Thus, for many in the country, they are still in the learning stage regarding the issue at hand (many, perhaps most, did not even know what a Niqab was until certain politicians decided this would be an election issue). This has therefore left a huge “public understanding gap” which a number of politicians are capitalizing on. These politicians have insinuated to the public that current (violent) Middle-Eastern events and / or “anti-Canadian values” can be tied to wearing the Niqab in a Canadian context, and thus they have filled the public misunderstanding gap with an emotional “plug” (regarding citizenship ceremonies, appropriate dress at court, what is “comfortable” clothing in a public space, what symbols are to be associated with radicalization, and even terrorism [Yikes! Seriously?? ], etc.). (Note: I am not making a political statement as to whether or not I support the Conservative party overall… I am merely stating that it is a fact that the Conservative Party has brought this issue into the public arena). The Conservatives have tried their hand at this debate with the rest of Canada, they have crafted their own messaging, and it is now dividing aspects of the Canadian population, and perhaps is paying political dividends (big sigh). I also know that this issue is dividing certain Conservatives and even Liberals within their own respective parties — right across the country (I have friends in both parties, and people in both parties seem to be torn over the issue, and how it has been politicized). This division within each respective party was perhaps an unintended and unexpected by-product of the debate. But it is also a division which is very present in Québec as well. It is being talked about across the country, and it has now become a Canadian debate in this respect, rather than just a Québec debate (regardless if one is Francophone or Anglophone). However… my personal feeling is that most Canadians feel that this should not be a public debate, and are rather indifferent to the issue (even if they vote Conservative), despite the attention it is garnering. A perfect indication of this: An election was called in Alberta today for later in May (Canada’s most big “C” Conservative province, and the province where I grew up, and in which much of my family still lives)… and this appears to NOT to be a matter which any Alberta provincial politician wishes to capitalize upon as an election issue (be it Progressive Conservative, Liberal, NDP or Wildrose). I think that says a lot (and I also know many people in Québec who had wished this issue never surfaced in Québec either). Nonetheless, on the Federal scene, I’m guessing this one debate alone has occupied 15%-20% of the Federal election-issue debate for the first third of 2015 (perhaps even 25% or higher). I personally feel that this is quite sad if these numbers are anywhere close to being accurate; what a waste of precious electoral debate time, especially when there are way more important issues to debate. On the other hand, perhaps it is a good thing that this is being debated… if for nothing else, than to get this debate over with as quickly as possible, and to bury this issue once and for all as a question of public debate; both provincially in Québec, and Federally across Canada. Time will tell what the outcome will be. If you have never “met” someone who wears a Niqab, I strongly urge you to have a look at the following 25 minute video interview in the CBC article below. It is an interview with a very well educated businesswoman / entrepreneur who wears the Niqab (does that in itself peak your curiosity??). This interview might help you to understand this Niqab issue better (I wish we saw many more video interviews like this, especially in French and in Québec… where I have so far seen no interviews of this nature to date). Within the first 24 hours, the above CBC article and interview garnered 2500 comments. I personally cannot remember the last time that I have ever seen a CBC website article accumulate 2500 comments in such a short period of time (I have been reading the CBC news online on an almost daily basis for over a decade, and I have actually never ever seen any of their articles garner 2500 comments). I think that shows just how strongly people across the country feel about the issue — either in support of the person in the video, or against the wearing of the Niqab under certain conditions. That is precisely why certain political parties are so quick to capitalize on the question, and turn this into an election issue; a perfect example of how Québec’s political and societal debates and sphere also affects the rest of Canada – coast-to-coast. The next post will provide an example of a public debate which is just starting to gain momentum in English Canada, which has the potential to become a significant issue, and which has the potential to make a jump from English Canada to Québec.